Please pardon the small image; I couldn't find a larger image of the correct cover photo. 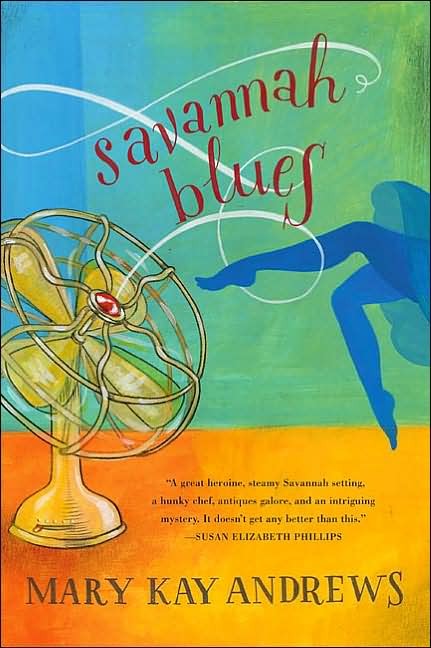 Reading about heat on a hot summer day is not usually what I consider entertaining and I've already elaborated on how much I disliked the experience of Savannah Blues. So, I was thoroughly surprised to find that Turtle Moon, which is set in the very steamy--and, I assume, fictional--town of Verity, Florida, elicited a completely different sensation. Why was I so mesmerized that the pages flew, in spite of the fact that I could practically feel the dirt and sweat and vaguely imagined I ought to be scratching chigger bites? Two words: characterization and story. This is my first Alice Hoffman book and I can hardly wait to get my sticky little mitts on another. The characters in Turtle Moon are absolutely amazing: believable, flawed, almost without exception damaged and all extraordinarily three-dimensional human beings whom the author describes in such vivid, quirky detail that you can't help but feel attached to them. Hoffman has a brilliant yet subtle way of creating characters with history who manage, in spite of their negative characteristics, to be likable. Even the character described as "the meanest boy in Verity" grabs hold of your heart and doesn't let go. The story is equally brilliant: part mystery, with romance, suspense and redemption added to the mix. In brief: A place where more divorced women from New York have landed than in any other Florida town, Verity is home to Lucy Rosen and her son, Keith. Lucy has moved to Verity to escape her ex, with whom she had little in common other than the strain of dealing with their troublesome son. Keith hates Verity, the heat, his mother, school, and pretty much anything else you can think of. When a woman in his building is murdered and her baby is left behind, Keith runs off with the baby. Officer Julian Cash and his two fierce dogs set out on Keith's trail. Thus begins a journey fraught with danger but with moments of tenderness. A funny, touching and surprising story that often strikes one as realistic simply because it is so original and, at times, even bizarre. Real life, after all, is pretty strange. Highly recommended, even on a very hot day. I've been trying to put a finger on what exactly it is about Mary Kay Andrews' books that I dislike. 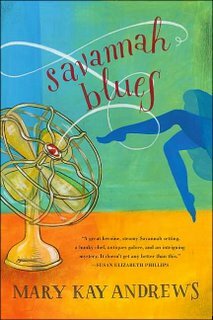 Savannah Blues is my second read by Andrews. The first was Hissy Fit. Everyone I've spoken to who's read Hissy Fit loved it. My opinion was that it started out nicely and then went downhill fast, particularly as I began to grow weary of all the descriptions of the overpriced decorative items that the heroine purchased for her client. Maybe the concept of investing major dollar value in a cast-iron pot to hold flowers on a porch or spending thousands just for one small piece of furniture goes too much against my grain. Hissy Fit just didn't do it for me. So, I opened up Savannah Blues a bit hesitantly. Again, the story had a fantastic beginning and the pages flew . . . for a while. After a time, that same sensation of being bored out of my mind swept over me. It wasn't a bad book; the writing was pretty decent. So, what exactly turned me off? Well, now that I think about it, there were quite a few things that bugged me. One was that the emotions of the characters didn't always fit the situation, in my personal humble opinion. To name characters in specific examples might spoil some surprises for those who enjoy her books, so I won't mention any of them by name, but when one character is arrested it sure doesn't seem to bother the person all that much. In fact, that character is much more disturbed by what people think than by the threat of being hauled off to prison for a very long time. Weird. In addition to the emotional issues - and I've only provided one example; there were several occasions in which characters flew off the handle for reasons beyond my understanding - it seemed to me that the author had trouble focusing and the storyline went all over the place. I completely failed several attempts to synopsize the story because it simply went in too many directions. On the positive side, Andrews' knows the South. Her skill lies in her ability to describe life in a small, Southern town. The mode of speech, mannerisms, what people are interested in and talk about, that strange sense of isolation from the rest of the world, the heat, humidity and profuse wildlife . . . her descriptions are dead-on. Maybe that's part of the problem. I get enough of life in the South, as is, and would much rather read a novel set someplace cold, someplace I'd rather be, myself, like London or Seattle. The last thing I want to read about while sweat is running rivers down my back as I wait in the heat for my son in a parking lot is . . . heat. Not to mention the fact that the heroine in Savannah Blues is one of those annoying people who will willingly barrel over you or grab something the moment you set it down at a yard sale. Yuck. Since I'm one of those people who has considered putting, "Early birds will be shot," in my garage-sale notices, in the vain hope that people would just wait till I opened the darned door in the morning, it's obvious they grate my nerves. I didn't like the heroine. Come to think of it, the hero was way too temperamental for me. The only character I really liked was the heroine's best friend. So, there you have it. If you like Southern fiction in the Chick Lit vein, this book is probably for you. Savannah Blues just wasn't my thing. 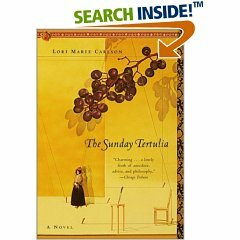 The Sunday Tertulia was one of the many books I purchased at our outlet bookstore's Going-Out-of-Business sale, this past weekend. When I flipped through the novel, it looked pretty interesting if a bit trite: one more book of alleged "wisdom", this time from a group of fictionalized Latina women at their weekly gathering, or tertulia. Because the author has taught Hispanic literature (as per the back cover blurb) and the central character speaks Spanish fluently, it's not surprising that the book gives one the sense that it's simply a nominally altered version of the author's life. That factor alone is not necessarily a bad thing; in the right hands, the idea may have worked. Unfortunately, the book falls flat. The heroine, Claire, is annoying, whiny and stupid. She complains about New York City being a heartless town filled with strangers and moans about her sorry dating life throughout the novel. Since Claire is in NYC by choice and the men she dates are often insulting, rude or arrogant during their initial conversations, she appears to be a seriously dim bulb plugged into a hinky socket. The women who invite Claire into their exclusive meetings are wealthy, shallow and dull; one never gets to know them fully as individuals and, frankly, this reader didn't care to know them any better after a certain point. Part of the problem is undoubtedly the form of the book. 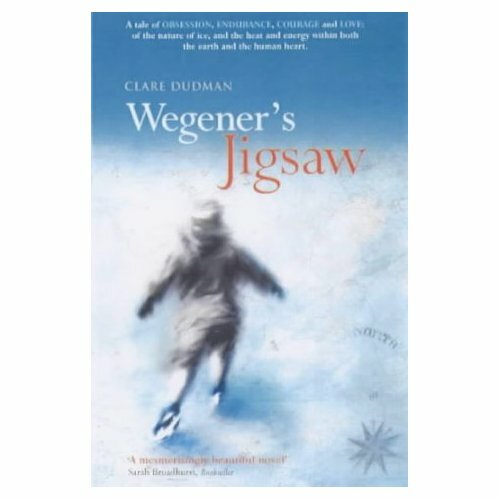 Each character's opinion on a topic is separated and labeled with her name, so there is never any real interaction or flowing dialogue - just one opinion, followed by another, followed by another, with occasional interjection of Claire's thoughts. I found myself rushing to get The Sunday Tertulia over with and probably should have abandoned it altogether. The book is so unmemorable that I finished it two days ago and promptly forgot about it. Had I not set the book down in an obvious place, I might have never gotten around to reviewing it at all. Definitely one to skip. 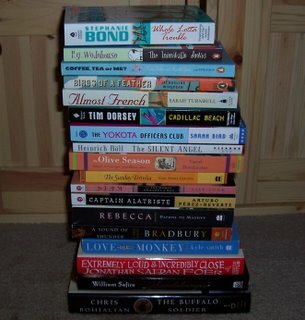 Unfortunately, this stack is the result of our local outlet bookstore closing. So sad. We'll be back down to one bookstore, again. I was so completely, totally blown away by this amazing, moving, wonderful, sad, beautiful book that I'm almost afraid to attempt to review it. But, I'll try. If nothing else, I'm willing to face up to the challenge of attempting to lash my thoughts into some reasonable facsimile of sense, especially if I can persuade others to read this astonishing book. 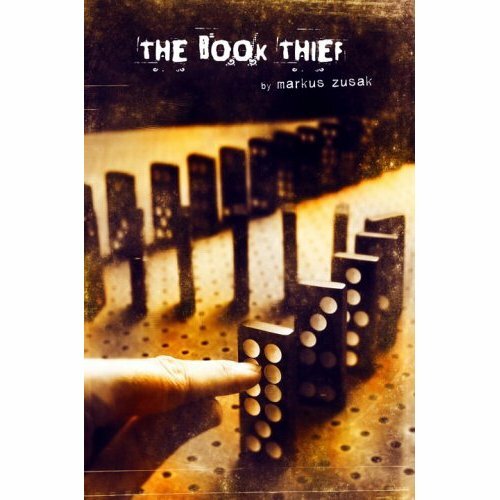 The Book Thief, set in Nazi Germany during the years of WWII, is narrated by Death and germinates from his fascination with a girl named Liesel Meminger, the "book thief" of the title. Her first theft is a strange one; she is unable to read but feels as if she's salvaging a memory by clinging to the little blue book. When Liesel learns to decipher the language within books, with the help of her "papa", she grows to find solace in words. There's so much more to it than just Liesel and her books. The author has taken a group of people--those who live with and around Liesel on Himmel Street in a small town on the outskirts of Munich--and made them so believable that they almost seem tangible. Very seldom have I felt such sympathy and attachment to a group of characters, in spite of their negative qualities. The book is billed as a Young Adult title, which strikes me as a little odd given the subject matter and the depth of characterization, the strength of its emotional impact, and even its length (my copy is 550 pages long). The publishers could easily end up chopping their own profits off at the knees by marketing the book toward a younger audience. However, the YA designation may be based on the fact that Zusak is already well-established as a Young Adult author in Australia. Certainly, it seems like a very adult book. And, yet, I can visualize The Book Thief in the hands of my 14-year-old and imagine the discussions that could be generated in a classroom setting. The Book Thief is a thought-provoking book, full of stunning imagery and, in my opinion, technically perfect with not the slightest deviation in tone. It's worth talking about, passing around, setting up on the good shelves for a future reread; and it has just rocketed to the top of my list of best books read in 2006. The Cruelest Miles tells the story of the famous Nome serum run, in which dog sled teams raced desperately needed diphtheria antitoxin from southeastern Seward to ice-bound Nome, Alaska to halt the growing diphtheria epidemic. 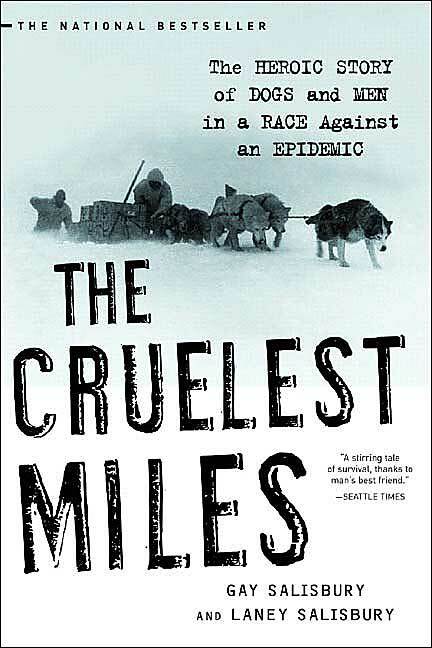 This book was recommended to me by a friend who read it while traveling in Alaska, last year. She thought it was a good choice for learning about the area and its history. 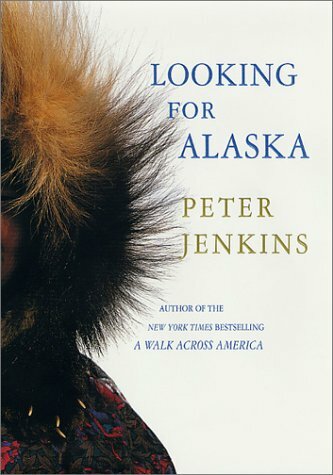 Since I was in the midst of reading Peter Jenkins' Looking for Alaska, I didn't manage to begin reading the book until we were in Kenai --our fourth night in Alaska-- and continued to read it in Anchorage and on our return trip. I was a bit baffled as to why the authors spent such a great portion of their time describing the history of both dog sled teams and aviation in Alaska, at first; but, as it turned out, the timing was perfect. When we visited the aviation museum in Anchorage, I was already familiar with the stories of some of Alaska's early aviators because of The Cruelest Miles and I'm certain I got a great deal more out of our visit to that small museum because of the book. As to the story of the diphtheria run, itself, the details were fascinating but minimal and not laid out in the kind of order I would have preferred. In fact, that portion was really quite jumpy and slap-dash, in my humble opinion. Apparently, there's not much more to the story than the descriptions of the weather, the experiences of individual dog-team handlers during their portions of the race, and a bit of controversy over which dog and driver deserved the most recognition; so, the time spent on background was necessary, if only to make the book long enough for publication. I found it a bit tedious, at times, because I was expecting more emphasis on the actual run. However, the book was intensely researched and well-presented if a bit dry. The winter weather was unusually bitter, even for the area, during the time that the serum was being rushed to Nome in 1925. For that reason, it was sometimes exciting to read about how each musher decided which path he should choose for the sake of balancing his safety and that of the serum versus the time that would be added by making the safest decision or the potential for disaster if he chose a more dangerous route to save time. Leonhard Seppala had the largest role, although I won't go into detail about where he was chosen to do his portion and what decision he made in order to avoid spoiling it for those who decide the book is worth reading. I will say I expected Seppala to be the man whose team was led by Balto, the team leader whose statue still sits in Central Park, in spite of having read something about there being a bit of controversy over which dog was lauded. Seppala's lead dog was not Balto and, in fact, Seppala was angered by the attention paid to a dog he considered less worthy than his own lead dog, Togo. There's plenty of detail to that aspect of the story. The descriptions of the dogs, how they were bred, the necessary qualities for lead dogs, and their ability to make decisions took up a sizeable portion of the text and made for some enjoyable reading. I'd give this one a slightly above-average rating - enjoyable and informative, sometimes gripping, but a bit sleep-inducing in its detail, at times. Looking for Alaska is a better choice for learning about Alaska, its natives, tradition, and life in Seward, but The Cruelest Miles is worth the time. I'm in a bit of a post-vacation slump and working on a blog about our trip to Alaska, but should finish The Cruelest Miles very soon. Hopefully, the review will be posted tonight or tomorrow. Then, perhaps I can get back to a normal reading schedule. Fingers and toes are crossed because it's been somewhat bizarre not having the time to read. I haven't gobbled up any fiction in at least two weeks and am really starting to feel a hollow pang from the lack of a great read. You know how that goes if you're a booklover. Peter Jenkins is well-known for his first travel memoir, in which he went searching for himself and his country in A Walk Across America. Nearly twenty years later and with seven published adventure books to his credit, now a father of six, Peter was feeling a little disillusioned and in need of a fresh adventure. So, he moved to Seward, Alaska for 18 months. Various members of his family popped in and out and joined him on a number of jaunts, with only his wife and youngest daughter remaining in Seward, occasionally tagging along on his journeys, year-round. 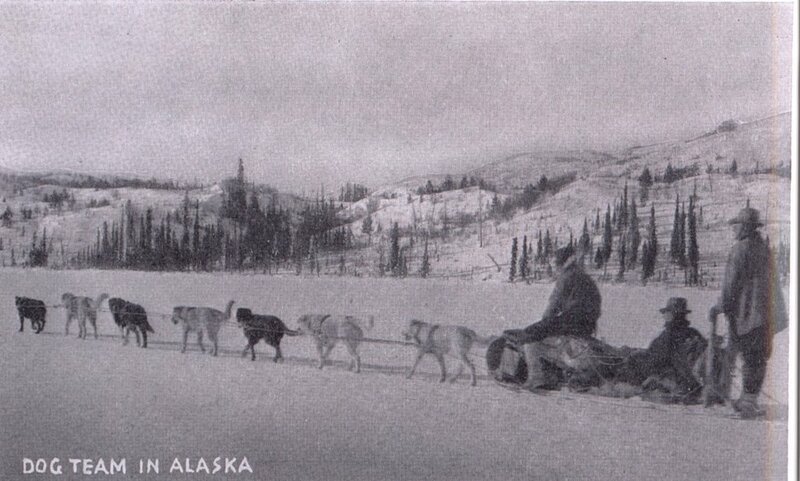 During his time in Alaska, Jenkins got to know the locals and was invited on a wide variety of adventures in which he observed a whale hunt, flew thousands of miles in bush planes, stayed with a man who lived 60 miles away from civilization and not that far from the Arctic Circle (on snow machines), visited an Iditarod musher and went mushing, took fishing trips, and kayaked to remote locations. Even as seasoned a traveler as Jenkins is, he was utterly awestruck by the scenery, the colors, and the people. It took me a while to get into this book and to become accustomed to his sometimes-annoying introspection; but, as far as books worth reading before setting out for the areas discussed, this particular memoir is superb. I read the vast majority of this book on the plane to Anchorage and then finished up while we were in Seward, this past week. Thanks to Jenkins, I noticed and was aware of details that otherwise would have escaped me. Hobo Jim, for example, is mentioned and described in detail; he’s Alaska’s beloved balladeer. A sign with his photo hung on a Seward bar. I would have overlooked it and I certainly wouldn’t have managed to talk my husband into buying a CD of his hits when we stopped for drinks in Russian River, had I not already babbled on about him. The family loved the CD and listened to it on winding Alaska roads, the perfect accompaniment for a drive through the mountains. Jenkins is humble and, apparently, has a love of people that is obvious immediately to most. As a result, folks opened up to him and chatted freely, invited him into their homes, and shared in a way one might not expect. As it turned out, we’ve never encountered friendlier people outside of our home territory in Oklahoma; his adventures seemed much less surprising when surrounded by a people of such remarkable warmth, humor, and openness. It’s the detail of his descriptions that make the book shine. He could stand a bit of grammatical help, now and then, but otherwise the book is excellent and I recommend it highly. I will be leaving for vacation, soon - an actual vacation of the variety in which one climbs aboard an airplane and flies to a cooler climate. Because, in the summer you go north. This is a rule of thumb for Southerners who hate the heat. Note the cold, snowy theme evident on the covers at left. I love nippy weather, anyway, and there's always a shortage of nip, in our air, outside of January. Not that it's going to be cold, but anything helps. So . . . for the last couple of weeks I've been puzzling over the decision regarding which books to carry in my handy, dandy backpack. This is critical decision-making territory, I'm telling you. Without books, I would cease to exist and then what would be the purpose of flying north, where the air is cool and the days are long? Naturally, the spouse keeps reminding me that they actually do, in fact, have bookstores where we're headed. So, I should keep it light. Right. I'm trying. I really am. And, what about all those magazines so recently purchased? Let's not even go there. I'm still working on the whole, "Damn, which should I take?" concept. It hurts, people. Just don't pinch me, right now, or I'll go ballistic.